N 27° 27' 57" and E 89° 38' 30"
Thimphu in Thimphu Dzongkhag with it's 98,676 habitants is located in Bhutan. It's the capital of this country. Current time in Thimphu is now 01:30 AM (Tuesday). The local timezone is named Asia / Thimphu with an UTC offset of 6 hours. We know of 8 airports close to Thimphu. The closest airport in Bhutan is Paro Airport in a distance of 14 mi (or 23 km), West. Besides the airports, there are other travel options available (check left side). There is one Unesco world heritage site nearby. The closest heritage site is Manas Wildlife Sanctuary in India at a distance of 100 mi (or 160 km). If you need a hotel, we compiled a list of available hotels close to the map centre further down the page. While being here, you might want to pay a visit to some of the following locations: Lungtenzampa, Paro, Wangdue Phodrang, Punakha and Ha. To further explore this place, just scroll down and browse the available info. Let's start with some photos from the area. 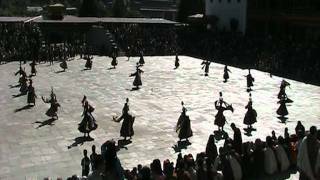 Dances of the Tsechu Festival in Thimphu, the capital of Bhutan. 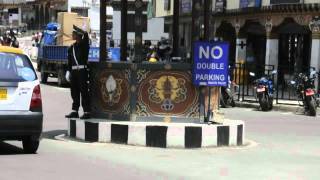 A police officer directing traffic in Thimphu, Bhutan They replaced him with traffic lights, but the locals were not impressed, so back he came. Is it some strange mime? or a Dance? 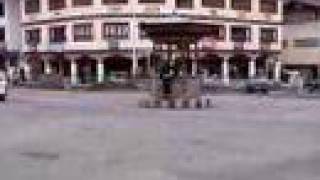 Thimphu Street and Traffic Video. Thimphu Tsechu in Bhutan http://en.wikipedia.org/wiki/Tsechu. Football (soccer) game between Nepal and Indian Armed Forced in Thimphu, Bhutan. 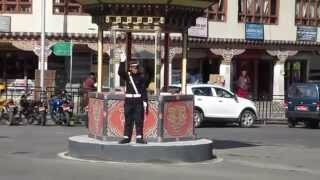 One of the most extraordinary and unique features of Thimphu: its human traffic light, which was restored after having briefly introduced an actual stop light some years before! Petit extrait "brut de tournage" (sans aucun montage d'où les imperfections) d'un concours de tir à l'arc bhoutanais traditionnel en bambou. Thimphu, also spelled Thimpu, is the capital and largest city of Bhutan. It is situated in the western central part of Bhutan and the surrounding valley is one of Bhutan's dzongkhags, the Thimphu District. The city became the capital of Bhutan in 1961. As of 2005 it had a population of 79,185, with 98,676 people living in the entire Thimphu district. Located at 27.4667, 89.6417 (Lat. / Lng. ), about 0 miles away. Thimphu District is a dzongkhag (district) of Bhutan. Thimphu is also the capital of Bhutan and the largest city in the whole kingdom. Located at 27.5833, 89.5833 (Lat. / Lng. ), about 9 miles away. Changlimithang Stadium is a multi-purpose stadium in Thimphu, Bhutan, which serves as the National Stadium. It is currently used mostly for football and archery matches. The stadium holds 25,000. 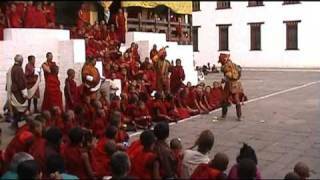 Changlimithang stadium was also the venue of Bhutan's first open theatrical production, which was A Tale of Two Cities. Located at 27.4714, 89.6411 (Lat. / Lng. ), about 0 miles away. The National Library of Bhutan (NLB), Thimphu, Bhutan was established in 1967 for the purpose of "preservation and promotion of the rich cultural and religious heritage" of Bhutan. It is located in the Kawajangtsa area of Thimphu, above the Royal Thimphu Golf Course, near the Bhutan Folk Heritage Museum and The National Institute for Zorig Chusum (Traditional Arts and Crafts). Located at 27.4833, 89.6322 (Lat. / Lng. ), about 1 miles away. Chagri Dorjeden Monastery also called "Cheri Monastery" is a Buddhist monastery in Bhutan established in 1620, by Zhabdrung Ngawang Namgyal. the founder of the Butanese state. The monastery, which is now a major teaching and retreat center of the Southern Drukpa Kagyu order, is located at the northern end of Thimphu Valley about fifteen kilometers from the capital. Located at 27.5983, 89.6472 (Lat. / Lng. ), about 9 miles away. The Royal Bhutan Police is responsible for maintaining law and order and prevention of crime in Bhutan. It was formed on 1 September 1965 with 555 personnel reassigned from the Royal Bhutan Army. It was then called the "Bhutan Frontier Guards. " 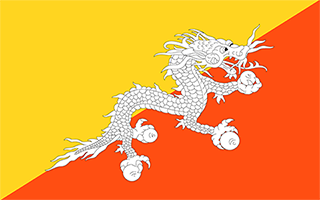 Its independent statutory basis was first codified with the Royal Bhutan Police Act of 1980. This framework was repealed and replaced in its entirety by the Royal Bhutan Police Act of 2009. Located at 27.4652, 89.6404 (Lat. / Lng. ), about 0 miles away. 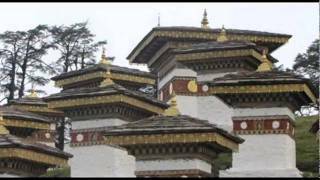 Tashichhoedzong བཀྲ་ཤིས་ཆོས་རྫོང is a Buddhist monastery and fortress on the northern edge of the city of Thimpu in Bhutan, on the western bank of the Wang Chu. 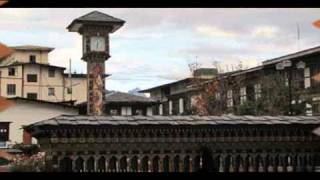 It has traditionally been the seat of the Druk Desi (or "Dharma Raja"), the head of Bhutan's civil government, an office which has been combined with the kingship since the creation of the monarchy in 1907, and summer capital of the country. Located at 27.4894, 89.635 (Lat. / Lng. ), about 2 miles away. The National Assembly is the elected lower house of Bhutan's new bicameral Parliament which also comprises the Druk Gyalpo (Dragon King) and the National Council. It is the more powerful house. Located at 27.4898, 89.6382 (Lat. / Lng. ), about 2 miles away. 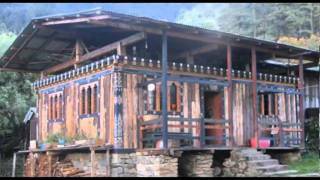 Dechen Phrodrang meaning "Palace of Great Bliss" is a Buddhist monastery in Thimphu, Bhutan. It is located to the north of the city. In 1971 it became a monastic school and currently it has 450 student monks enrolled in eight-year courses with a staff of 15. The monastery contains a number of important historical Bhutanese artifacts including 12th century paintings monitored by UNESCO and a noted statue of Shabdrung Ngawang Namgyal on the upper floor. Located at 27.5011, 89.6325 (Lat. / Lng. ), about 2 miles away. The Royal Institute of Health Sciences (RIHS) is one of two main medical education centers in Bhutan, the other being the Institute of Traditional Medicine Services. The RIHS was established in Thimphu in 1974 as a member college of the Royal University of Bhutan, and is associated with the National Referral Hospital. The RIHS offers diploma and certificate programmes for nurses, medical technicians and other primary health care workers. Located at 27.4647, 89.6372 (Lat. / Lng. ), about 0 miles away. The National Referral Hospital (full name Jigme Dorji Wangchuck National Referral Hospital) is the main hospital in Bhutan, located in the capitol, Thimphu. Since it was established in 1972, the hospital has been supplying free basic medical treatment as well as advanced surgeries and emergency services to citizens from all over the country. It provides the most sophisticated health evaluation and management services in the country. The Institute of Traditional Medicine Services is based in Thimphu, the capital of Bhutan, located on a hilltop above the Traditional Arts Center and the National Library. The Institute supplies traditional medicines and medical services, trains doctors, and conducts research on traditional medicinal plants to identify the ingredients and develop new products. The Institute has a library dating back to around 1616, when Tibetan Buddhism was introduced to Bhutan. Located at 27.4825, 89.6322 (Lat. / Lng. ), about 1 miles away. Bhutan Postal Corporation Ltd. , or Bhutan Post, is the company in Bhutan responsible for the operation of the postal system. Located at 27.4738, 89.6387 (Lat. / Lng. ), about 1 miles away. The Paro Chhu is a river of western Bhutan. It is a tributary of the Wong Chhu, which is known as the Raidak in its lower reaches. Located at 27.3167, 89.5333 (Lat. / Lng. ), about 12 miles away. The Dzongkha Development Commission (རྫོང་ཁ་གོང་འཕེལ་ལྷན་ཚོགས), also called the DDC, is the pre-eminent body on matters pertaining to the Dzongkha language. The DDC was officially established in 1986 by Jigme Singye Wangchuk, the fourth king of Bhutan, to preserve and promote the use of Dzongkha as the national language of Bhutan. The DDC offices are now located in the Kawajangtsa area of Thimphu, close to the National Library of Bhutan and the Ministry of Education. The Bhutanese Ministry of Home and Cultural Affairs is the government ministry within the Lhengye Zhungtshog (Council of Ministers) which oversees law and order; the civil administration; immigration services; the issuance of citizenship documents, and other related documents; the delivery of services by local governments; and the preservation, promotion, development, and protection of the culture and heritage of Bhutan. The Royal Academy of Performing Arts (RAPA) is a Bhutanese government body within the Ministry of Home and Cultural Affairs, Department of Culture, that supports the preservation of traditional Bhutanese culture. It was founded in 1954 under the initiative of the Third Druk Gyalpo Jigme Dorji Wangchuck. In 1967, it was institutionalised as an academy and the Royal Dance troupe was its creation. The Academy is located in Thimphu, along Chhophel Lam. Located at 27.48, 89.64 (Lat. / Lng. ), about 1 miles away. These are some bigger and more relevant cities in the wider vivinity of Thimphu.